Call them what you will, cloth, reusable, eco, real – they are increasing in popularity and if you are yet to convert, I’d highly recommend giving them a go. We wanted to try cloth nappies for the convenience, price and environmental impact but were put off by horror stories, hearsay, objections and idea that only extreme earth mothers master them. Of course, all our misconceptions were a load of old tosh and with five minutes on Google and a couple of recommends from friends within a couple of days using cloth nappies we aren’t looking back! They very easily have become our new normal. Aren’t they expensive, complicated, smelly and lots of hassle? 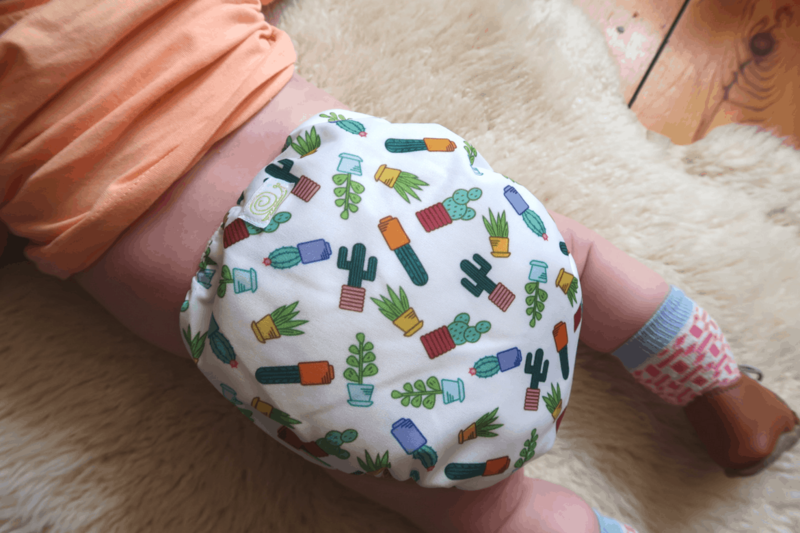 Below are the crappy myths that put us off using reusable nappies and how the gorgeous planet friendly, baby boutique Baba and Boo helped to bust them! #Bumbusting #Clothbummums. They may be pretty, but they are PRICEY. You can buy a Baba and Boo One size nappy (10lb to potty) for £12.95 with two liners included. That’s’ a bit expensive says your brain…I can pop in to Tesco today and you can buy a 54 pack of Pampers at half price for £4. Aldi’s Mamia nappies average at 8p a nappy. It seems like a cheaper option to buy disposable. But then you realise a new born is changed 10-15 times a day. A toddler, 5-10 a day, so from birth to potty training most children will on average, use 10 nappies a day. That’s 3650 nappies a year. Let say your child uses the toilet by three. That’s terrifyingly 10,950 nappies totalling about £876 pounds. At 4 months my daughter uses 6 nappies a day. You can buy six Baba and Boo print nappies for £77.77 if you wanted to wash them daily. Or why not buy twelve for £155.40 and wash them every two days? A 30C wash costs an average of 15p a cycle for water and 4p for electricity. A washing line and sunshine cost nothing! It’s a FACT that yes, reusable nappies involve set-up costs, but considerable savings can be had. Why not gradually build up your supply or buy a starter bundle? For example, Baba and Boo offer a 10-nappy kit with bucket, two laundry bags, storage bag, biodegradable lines and 2 inserts for £135. You can buy preloved nappies cheaper online and local councils offer incentives such as free trials, laundry services and cashback on reusable nappy purchases. A MINKY is not an animal, it’s a soft fleecy covered nappy. There is also the opportunity to recoup money selling nappies online or you save them for siblings. Ideally you want about 15-20 reusable nappies when you get into the swing of day and night. If you spent £200 on reusable nappies and had the ‘average’ two kids a cloth household will just spend the £200 with a few more washes. A family using disposable nappies for two babies will spend £1752. In everyday life you don’t always grab a calculator and work out savings. I was put off by reusable nappy prices at first and it took me looking at easy black and white figures to realise I will save hundreds of pounds. Cloth nappies are too complicated. I WONT BE ABLE TO LEAVE THE HOUSE. Cool your jets. It’s a nappy, not rocket science. It took me a perhaps a week to get used to using cloth nappies, working out roughly how many a day I’d need, how often to change baby (every 2-3 hours-it’s the same! ), the practicalities of how often I wanted to wash them, how I would store them etc. The vast variety of types of nappies, brands etc can leave you running for the supermarket. Baba and Boo, Totsbots and Bambino Mio are our favourites. For ease of use we decided to use nappies that looked and worked like a normal, disposable nappy, that didn’t need a wrap or plastic cover, were easy to wash and dry, and could be used from newborn to toddler-hood. Baba and Boo Pocket nappies consist of a waterproof outer and a fleece inner. They are simple and quick drying, perfect for containment and absorbency. You simply stuff in two nappy inserts (choose from hemp, bamboo or charcoal to increase the nappy capacity) and add on top a liner (basically a thin, flushable biodegradable cover that catches poo). Did you know that, technically, you’re supposed to do this with disposable nappies too, so that faecal nasties doesn’t go into landfill? I didn’t. We put used cloth nappies in a sealed bucket, with a laundry net in it, and when the bucket is full, or it is wash time, I lift the net into the washing machine, and voila. They get hung up outside and then I spend a few minutes stuffing the clean inserts in and putting them away. No extra soaking, no fuss. What’s one or two extra loads a week when you have a baby? Adding cloth nappies to your routine barely takes any time at all. My baby will SMELL and I don’t want my washing machine full of POO! The non-absorbent properties of fleece make it an excellent wicking layer to line cloth nappies with. Urine passes through into the absorbent core but is prevented from sitting next to the baby’s skin. There is no wetness. Liners catch the poo which goes down the toilet not into the machine. Also, aren’t you putting in sicky muslins and dribble bibs? Sweaty clothes? My seven-year-old sons underwear is probably more ick than my baby daughter’s reusable nappies. Giving reusables a warm rinse before washing will help lift dried-in stains and keep your nappies fresh and ammonia free. Sunshine helps to naturally sanitise and is great for stubborn stains but be careful about hanging them out when it’s too hot, as high heat can damage your elastics and waterproofing. When out and about you simply need a couple of wet bags. They seal and don’t leak so are easy to use. You do need to take into account clothes when using cloth nappies as they do take up more room in trousers, baby-grows and tights. Also, yes a cloth nappy may sit dirty in for up to 3 days depending on how often you wash them, but a disposable will be sitting in a binbag up to a week or two depending on your next bin collection. A disposable nappy still has its place. It doesn’t need to be all or nothing. Every time you use one reusable nappy you are saving a disposable one from ending up in landfill, so whether you do it full time, part time or something in between, that is great. Do you or would you like to try using reusable nappies, what is stopping you and have you heard of any interesting cloth bum myths? Note: We were given a couple of nappies to try, our opinion is honest and our own and we have bought loads more ourselves since.